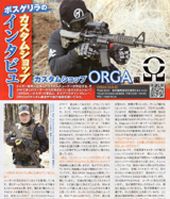 The ORGA Magnus WideBore barrels keeps are 6.10mm to 6.23mm inner diameter while adding new design features. The most significant design change allows you to easily install the same hop system that we use in our ORGA Custom Shop. This further enhances the barrels potential for AEG systems. The hop window has also been custom designed to allow for a more stable hop. Today we will look at why we decided to go wide bore design. As for Precision, The velocity of the BB in an equal length precision barrel tends to increase, but there is also a dramatic rise in barrel friction on the BB. Hop-up spin can be decreased by this friction, which will affect distance. The ORGA Magnus WideBore barrel increases accuracy and trajectory by reducing barrel friction and inner barrel bouncing. The width of the barrel ensures that hop-up spin is constant and consistent when it exits the barrel. This allows for precise, long range shooting, with 45-55 meter accuracy at under 1J. → Which AEG will give you better distance and accuracy? =The Answer is AEG 1. * Since both AEGs have the same muzzle velocity but the Magnus 6.23 is pushing more uninterrupted air the BB stays in flight longer with greater accuracy. * The Magnus Barrel can delay the reduction of power behind the BB because the amount of force pushing the BB is far greater than the TightBore barrel. Precision barrels can have a tendency to clog and jam as they collect dust, dirt, and BB residue. The Magnus WideBore barrel helps prevent clogging, as well as piston and gear malfunction. As the number of high-cycle products being released by manufacturers increases, the number of users wanting high cycle weapons that are still accurate and consistent rises as well. The Magnus barrel helps high-cycle players get more out of their investment. Not everybody wants to open up and tinker with their mechbox. Why fix what isn’t broken? 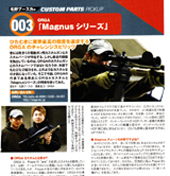 The ORGA Magnus barrel provides immediate benefits with a simple barrel change.